A video went viral earlier this month in Mexico. 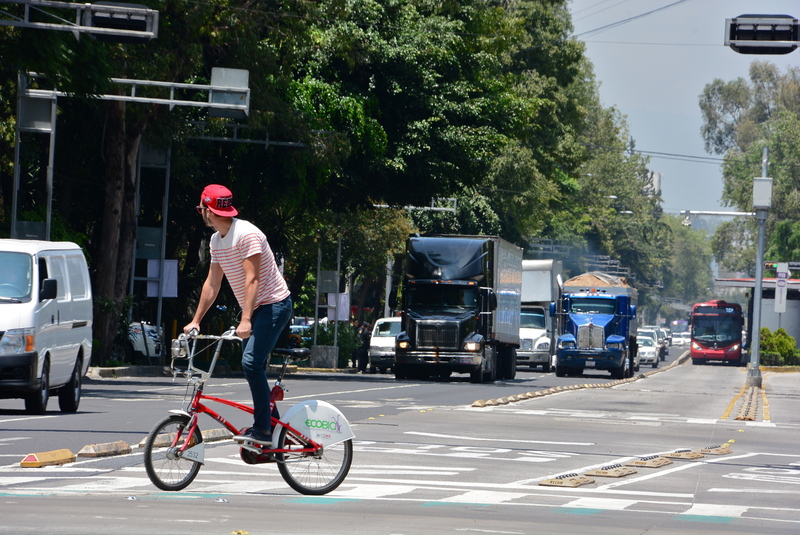 Ari Santillan, urban activist and contributor to TheCityFix Mexico, was biking home after work on a dedicated bus-bike lane in Mexico City when a car, driving illegally in the lane, started harassing him to get out of the way. Ari refused to do so, angering the driver, who became more aggressive. When Ari finally found a police officer, the driver tried to run him over. Luckily, Ari was able to jump off his bike and leave the incident unscathed. What happened next has become an all too common scene in Mexico. The driver, an upper-middle class man driving an Audi, got out of his car, threw the bike to the sidewalk and started shouting at Ari—and then at the police officer. When the officer tried to stop him from getting into his car and driving off, this man, now known as “Lord Audi,” started to push the officer away. Eventually the man managed to escape the officer’s grip and drive off, dragging with him an EcoBici bike that a fellow citizen had parked in front of the car to stop him from driving away. Far from being a unique occurrence, this kind of event is becoming more and more recurrent in Mexico—a country with a profound class division, plagued with corruption issues. Particularly in Mexico City, people from all socioeconomic levels are fed up with their living conditions and tired of the rich and powerful acting above the law and doing as they please, without any fear of punishment. This incident highlights several problems facing Mexico City. For decades, the city followed a car-centric model of development, and investment in public transport fell. As a result, the city is now “the most congested city in the world,” according to a report released by TomTom in March 2016. However, the local population views actions against excessive car use negatively, and local officials often don’t want to risk of taking unpopular actions. Because of this, the city is plagued by road safety issues, particularly for cyclists and pedestrians, who often find themselves in vulnerable and dangerous situations on the streets. A further problem is the prevalence of what can be described as the law of the jungle, where self-interest is the main driver for people’s actions, without regard for their neighbors. Recently, there have been multiple cases of people believing and acting as if their socioeconomic status puts them above the law—including a media mogul who ordered his bodyguards to hit a government official and rob his cellphone as revenge for forcing them to obey the law; and a young woman who, after being pulled over for DUI, tried to bribe the police while cursing at them. Faced with an authority unwilling to do anything to solve the problem, the victims of this kind of behavior—everyone who isn’t a member of this social class—have no choice but to document the incidents and denounce them in social media. This is where the Lord/Lady designation comes from—as a way of mocking this sense of entitlement. Lastly, the video simply highlights the lack of enforcement on the part of public authorities. Many police officers in Mexico have little training, work under unfavorable conditions and do not know how to deal with these kinds of incidents. And when they do know how to handle this kind of situation, a bigger problem arises—corruption. In the end, most Lords and Ladies do not have to face justice, as a quick bribe or exertion of influence will get them out of trouble. Cities Safer by Design, an urban design guide published by WRI Ross Center for Sustainable Cities, aims to promote safer streets by changing the way we build and design our cities. The ideas and principles presented in the guide can be used from this point forward by Mexico City’s authorities to redesign the streets. Currently, streets in Mexico City do not provide enough safety to its most vulnerable users. Additionally, there needs to be a shift in how Mexican citizens consider themselves part of society. There’s currently a general lack of empathy and social awareness noticeable at all social strata. Public awareness campaigns, through the government or private actors, can be a good way of changing the common mentality. For example, “Yo me fijo, yo respeto” (I’m aware, I respect), a campaign that Mexico City’s government launched earlier this year, is part of the Vision Zero strategy to reduce traffic fatalities. Corruption and lack of enforcement will continue to be tough challenges to tackle. However, there has been recent progress through campaigns that invite people to denounce acts of corruption they’ve witnessed, through NGOs dedicated to fighting corruption and through policies that have improved working conditions in police departments across the country. There’s an undeniable shift taking place in the public conversation around these kinds of incidents—mainly as a result of widespread social media. Perhaps this kind of awareness will finally create the profound change needed to make Mexico City, and cities across Mexico, safer and more just places for all.